I currently do not have an ETA on exactly when it will arrive, but that will become clearer as move towards our upcoming updates and the news surrounding that. Once again, thank you for all your feedback. The post was edited 1 time, last by Evoque: uploaded image for those who cannot access the hosting site. ( Apr 17th 2019, 11:15am ). The post was edited 1 time, last by DildoSwaggings ( Apr 16th 2019, 4:53pm ). Great addition, thank you. Besides making favorites, can we forget / erase islands from the list, that we no longer wish to visit? oh finally... yes, this is great news! The life bar looks entirely different too, can we also expect a facelift on names/health bars? We're pleased you guys like it, and I will pass on your suggestion and see what the status is! This is just a concept template used by the artists, but if you have more suggestions in that direction we would be happy to hear it! I understand that this would make things trickier for bloodletters or stalker hoods, but it would make things easier for everyone else. Maybe a mix in between? Either way gives a very visual indication of who's tanky and squishy. This will be a fantastic update. My suggestion would be to add a tab to show just cities, Islands and Guild islands. The filter drop down I guess could help with that. The post was edited 2 times, last by DoomRawrus ( Apr 16th 2019, 9:05pm ). its going to be best major update, well done! Sweet mother of God. Yes!! I was just getting ready to post another video of the list of islands that I have to go through every day to visit the islands I farm. @Evoque can you please use a different image hosting site? some people like me are only able to see the image only via vpn. You're making the island name big? This will not help the scrolling amount / time required to get to the bottom of the list. Make a character and give him access to 80-100 islands and compare the time and amount of scrolls it takes to get to the bottom of the list, with various mouses. Then you'll have something thats accurate of what many people do when they want to visit an island on their list. it s the editor not the list. 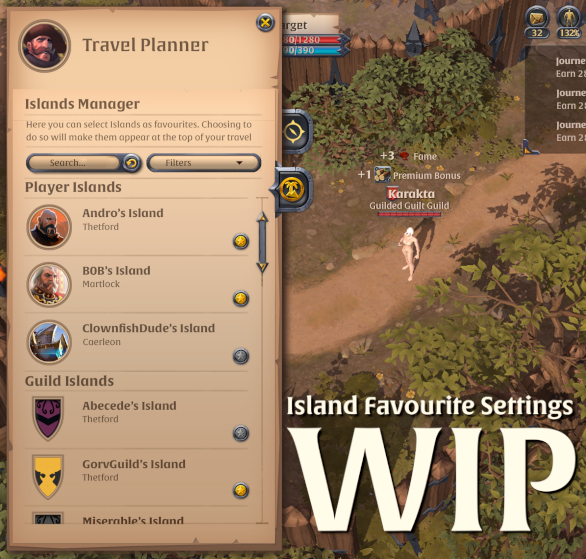 This will be an additional tab in the travel planner UI, which only allows me to manage the islands I have been given access to. It will not serve as a replacement for the main travel tab. This second tab will allow me to select islands from the list as favourites. These favourites will then be sorted alphabetically to the top of my travel destination list. Additionally, we want to make the dropdown list of destinations searchable, allowing for much quicker navigation of longer lists. We have discussed the ability to remove/hide islands from the list, but have finally decided not to do it (at least not within this iteration). The reason for this decision is simply that we want to launch this ASAP, and this would require significantly more code time and does not add an equivalent value. Simply letting you remove/ hide an Island will not do. There would also have to be a system in place to get the islands back, in case you made a mistake removing them. This is exactly what the filter here is supposed to do! I hope my post clarified some things? Your Idea of giving multiple favourite options is not bad, and I will put some thought into it. Realistically this would be something for another iteration though. Apologies @solventh, I have attached the image now to the post, is that accessible and a better format for you?